I am pleased to announce that — thanks to the generous patronage of The College of Physicians of Philadelphia and Mütter Museum, and thanks to my thoughtful friend Anna — I will be the featured speaker at Philadelphia’s Science on Tap, this April 14. If you don’t know, Science on Tap is a monthly gathering at Philly’s National Mechanics bar and restaurant in which folks wander in to drink good beer, eat good food, and listen to an informal presentation by a scientist or other expert followed by lively conversation. The goal, say the Science on Tap folks, is to promote enthusiasm for science in a fun, spirited, and accessible way, in the sort of venue where people are at their most relaxed. What do The Epic of Gilgamesh, James Cook’s Voyage Toward the South Pole and Round the World, the dairies of Gruyères Switzerland, and our speaker’s home kitchen all have in common? Fermentation! We can define fermentation as a biological process: as the metabolization of sugars by yeasts, bacteria, and sometimes our own cells, into gases, acids, and alcohol. For denizens of the microbial world, it’s a matter of eat, then excrete. But for humans, fermentation is a cultural process. Bread, beer, dairy, pickles, and preserved meats have all been key ingredients in the success of agricultural, sedentary, urban societies. And they have all been essential to long voyages of exploration. 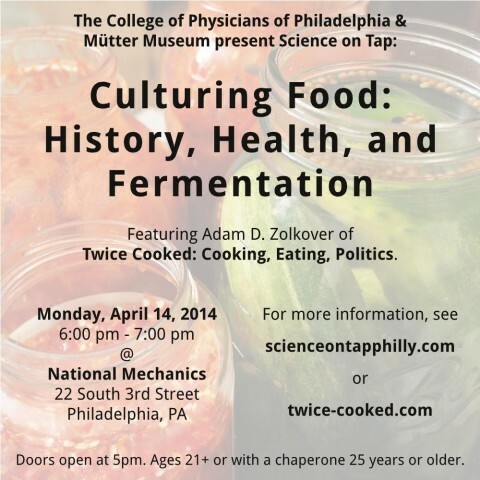 This talk explores the intermingling of science and history in the kitchen. And it explores some of the practical aspects of fermentation for home cooks today. As you can see, I will likely be taking the actual “science” part of my charge fairly loosely. I’ll be speaking about some about the biology of fermentation, but that’s not really my area of expertise. Mostly, I will be on about its importance as a cultural construct and as a historical force. I will be speaking about fermentation in literature. And I will be speaking about the health benefits of making and eating fermented foods at home. As I said: this shindig is happening Monday, April 14 at National Mechanics. The talk itself starts at 6:00 pm, but doors open at 5:00. You’ll be able to order both food and drink (it’s actually a great place to eat dinner). So come out. Chow down. Enjoy the fermented juice of the barley. And contemplate your beverage’s miraculous bioactivity while I talk fermentation. Eventually, you’ll be able to get more information from the Science on Tap website. Or, you can go look at the Facebook event page right this minute.